And others chose the Cornet eloquent. To sing Mens Triumphs, or in Heavens quire. 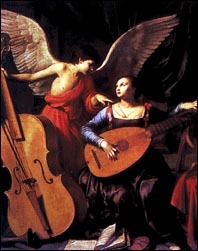 St. Cecilia with the Angel, by Carlo Saraceni, c 1610. Created by Anniina Jokinen on February 9, 1997.